A Year Through The Lens: Day 108 - Pockets of Honkers. It was sad to say 'see ya' to my Chinese family and friends and leave Kunming via the new US3 billion dollar airport that has just opened. Impressive. All good things come to an end, a new adventure is only just around the corner. Well it was when Israeli girl next to me freaked out at the turbulence whilst coming into Hong Kong. All ended well, arh, it added some excitement. Hong Kong is currently on Typhoon watch, at present no. 1. 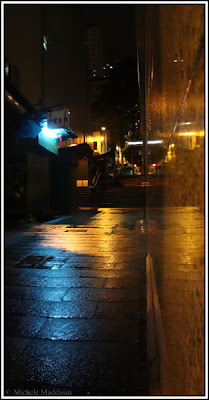 So the rain has set in, and at night it puts a different spin on all the amazing pockets of Hong Kong. You can go from the bright as day night spots of Central, to the just lit alley's from Sheung Wan train station great place to explore.